I got stuck watching TV tonight. Thankfully, It was a great one! 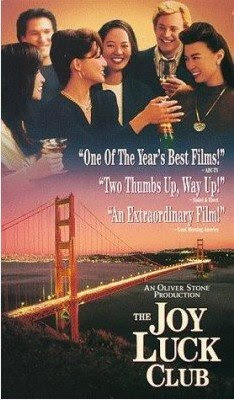 "The Joy Luck Club" is a very touching film about the lives of 8 Chinese women and how their journeys have all intertwined and have influenced each other. A movie that highlights the best part of mother-daughter relationship. The plot was wonderfully woven and It had given the movie it's solid foundation. It's strength is to be found not just in the excellent and convincing portrayal of the actors, and artistic (yet effective) cinematography, but how as a viewer, one cannot stop watching. Something is always happening. The story line was pretty fast, yet precise and clear you will not get bored if you had started the movie from the very beginning. What I like about this film is that it shows the plot from a much deeper perspective. The movie had successfully shown not just what happens as they happen, but shows you what actually goes on inside the minds and the heart, and best of all the "soul" of each of the major protagonists in the film. Truly an excellent movie. I highly recommend it to everyone. The cast and crew certainly did a wonderful job and created a tresure that will always shine in many years to come.